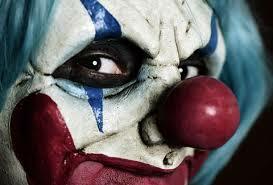 A young woman had a dream in which she saw a clown staring in at her from her kitchen window. At first she was amused, but then the clown became sinister. It also multiplied so that, by the end of the dream, there were numerous scary clowns trying to get into her house. * Kitchen: It’s really the hub of my household. It’s where I make the meals that sustain my family. But it’s more than that. It’s where we gather and share. * Cooking supper: For us, it’s the main meal of the day. We not only replenish our physical bodies with the food, but we actually renew our relationships and re-bond while we eat. * Window: You can look out a window and see the wider world, but you are protected from the elements. It’s a buffer. * Sink: It’s one of the main areas of food preparation. Its main purpose is cleaning, washing and preparing. * Clown: Well, usually clowns are a diversion and an amusement. They make you laugh which releases tension in a harmless, healthy way. If they’re good, clowns can be really entertaining. * Startled: It was unexpected. I don’t usually have that kind of experience while I am preparing a meal, and I was taken aback. * Started to laugh: I was amused and entertained. I was delighted. * More sinister: Humor has a dark side. If you are innocently included in the lighthearted revelry, then that’s one thing. But if you are being mocked or demeaned, then it’s unpleasant. In this case, I had the feeling that there were ulterior motives. I had the sense that he wanted to harm me. * Uglier, more menacing: He was starting to act in a threatening manner. * Two clowns: The threat doubled. * Clowns at the sliding glass door: The menace keeps growing. * Clowns all over: It was becoming overwhelming. * Scary faces: Yeah. By now, I was really frightened. * Wanted in the house: They were trying to get into my personal space. I wasn’t sure my protective shield would be strong enough to keep them at bay. That was terrifying. * Started screaming: It was both a desperate cry for help and also a release from my own tension. There was an element, too, of it being the only thing I knew how to do to fight against them. If you read only the dreamer’s replies, you soon discover a dominant theme running through this dream: Something that ought to have been lighthearted and entertaining becomes sinister. We’ll ask the dreamer more about this on Friday.